5:04 PM PT, 6-17-12: It’s presently five o’clock Pacific Time, and while the temperature here in Sacramento is about 96 degrees, it feels like it’s about 196. Having arrived early Saturday morning for Anthony Sanchez’s Strange Lights UFO Paranormal Conference, it was a long flight out across the American skies, holed up in an aisle seat reading Edward Ruppelt’s The Report on Unidentified Flying Objects, while glancing across the bobbing heads of passengers occasionally to cast an eye toward the horizon. Maybe I hoped some saucer, the likes of which Kenneth Arnold and so many others have seen out in this part of the world over the years, would make its presence known today. Whether or not a UFO would appear over other locales, namely my destination at the Crown Plaza at Madison and I-85 in Sacramento, still remained uncertain. Of one thing, at least, I could be absolutely sure: that the present aircraft, Delta Airlines flight 320, was about to touch down over the city famous for the “strange lights” seen in its skies going all the way back to the 1890s, during one of the famous alleged “mystery airship” flaps more than a century ago. The presence of extraterrestrials in relation to those famous cases remains questionable for many to this day; quite the contrary, the presence of odd “alien” types almost seemed to be a given from the looks of things upon my own arrival in this odd and interesting California town. 2:34 PM MT, 6-18-12: First, and in an effort to give full disclosure, I’ll point out that various parts of this article were written in a hotel, on a veranda, in an airport, and with the case of the present sentence being formulated, from a window seat situated directly over the right wing of an aircraft that carrying me high above terra firma, coasting along over the heartland. I try not to write too much while I’m traveling, especially when long-distance flight is involved (let alone underway in the immediate sense). The odd hours, the sleepless nights that are often followed by restless days, and the general wackiness of paranormal and UFO conference attendance can be daunting. But the circumstances here were almost just too good not to be afforded some degree of attention thrown at the printed page. 11:27 AM PT, 6-16-12: Arriving in the lobby at our hotel, I was greeted warmly, as always, by Scotty Roberts at the front desk, before soon being ushered into a room across the lobby area where a few of the vendors and presenters had set up their tables to sell books, sign autographs, and exchange other promotional materials and activities. We had a nice table set up for the Paradigm Symposium 2012, in promotion of the event that Scotty and I are putting on later this year in Minneapolis, with printed cards, banners, and books lining the surface before us. Nearby our friends Lyle Blackburn, author of ?The Beast of Boggy Creek?, along with David Weatherly, who has emerged as the foremost new expert of “Black Eyed Children” phenomenon, shared a table; to our other extreme, SyFy’s? Fact or Faked ?star Bill Murphey discussed a variety of strange phenomenon. And of course, sharing our table was Paul Bradford, the mighty English tech adviser and star of ?Ghost Hunters International?, who kept everyone laughing with his loud and highly-rapt humor and intellect (that’s Paul striking a silly pose with me in the image at right, courtesy of Walter Nowosad). 11:32 AM ET, 6-19-12, back at the Gralien News Desk: The majority of the conference was a blast, and the views expressed by the speakers present ranged from the overtly conspiratorial, to the holistic and otherworldly. 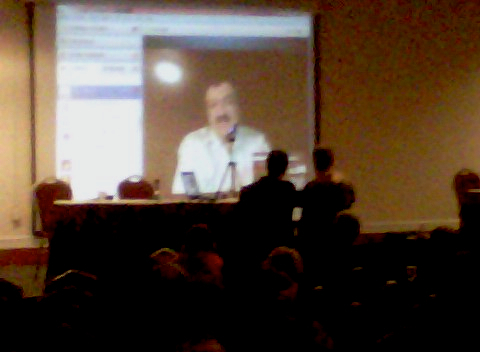 George Noory of Coast to Coast AM joined us for a live Skype chat about midway through (see image, right), and other speakers included conference presenter Anthony Sanchez on his UFO Highway, Michelle Many on acoustics and 2012, Jaw Weidner and Project Camelot’s Kerry Cassidy. For me, the highlight of the weekend was the panel discussion at the end of the third day (8:10 PM PT, 6-17-12). 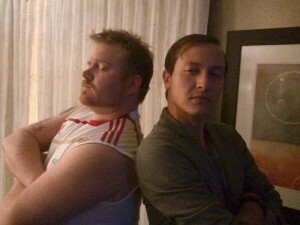 It was the last “official” event of the conference, and Scotty Roberts and I had been placed as panelists to discuss 2012. Doing a weekly program like The Gralien Report, I have plenty of time already to sound-off, and so I figured that I wouldn’t concern myself too much with jabbing elbows to fight my way to the microphone amidst our other panelists. I let everyone have their say, including Scotty, who sat beside me like an excited child, whispering things throughout the presentation (if you know Scotty, you know what I mean!). Finally, Mel Fabregas, the event’s moderator, came over and told me he would “make closing comments, then give me the last word.” Having waited patiently to the very end, I decided I’d get to the point, and broke my feelings on 2012 down in about fifty seconds: The world ain’t gonna end, though I’m sure Quetzacoatl’s still soarin’ high up there somewhere. While politics of today are largely a farce, there are conspiracies; but the real ones are those which most of us know nothing about (maybe I’ll make that my subject for next year’s conference). So far as a spiritual connection to all this, that’s up to us as individuals… and what symbolic meaning we’re able to take away from them ourselves. What we choose to share of this with others is also in our hands. Somehow, I managed to elicit a nice applause from the audience for this focused little burst… I was just glad to know a few of them were still awake that late on a Sunday evening. I’ll be discussing more about Anthony’s conference (to which I’m sure many of us are looking forward to a repeat performance next year) on this week’s edition of The Gralien Report Podcast, which will air live tonight (Tuesday, June 19, 2012), and then be made available afterward as a downloadable audio file. Stay tuned! The Gralien Report Podcast: Erich von Daniken, Late but not Lost!